In 1988, Shi Zhengrong arrived in Australia as a foreign-exchange scholar from Shanghai with a master's degree in optics. To have come this far was already a significant achievement. Shi and his twin brother were born in a farming community on Yangzhong Island in 1963. Destitute after the great famine and already supporting two children, Shi's parents gave him, the younger twin, up for adoption. The boy excelled at school and his adoptive parents honored his teachers with a great banquet before their 16-year-old son left for university in Manchuria. In 1989, Shi knocked on my office door at the University of New South Wales (UNSW) in Sydney seeking full-time work. Instead, I offered him a scholarship to do solar-cell research. Shi earned his Ph.D. quickly, and in 1995 we appointed him deputy research director of a university spin-off that was developing next-generation solar technology. But in 2001, he forsook this relative security and moved to the Chinese city of Wuxi to head a solar-cell start-up company. With $6 million in backing arranged by Wuxi's government, plus the assistance of ex-colleagues at UNSW and his own unrelenting drive, Shi soon had his first factory operational. Sales boomed as the market for solar technology rapidly expanded, stimulated in part by Germany's new renewable-energy legislation. 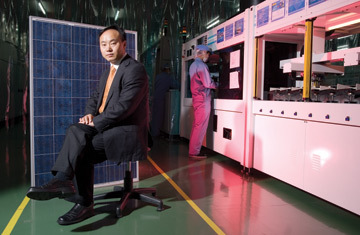 In 2005, Shi organized a buyout of his Chinese investors by U.S. firms, and in December that year Shi's firm, Suntech Power, became the first private Chinese company to list on the New York Stock Exchange. Today, Shi is a billionaire  one of the wealthiest men in China and, for that matter, one of Australia's richest citizens. But this is not the end. Suntech Power continues to grow at a startling rate, with a current market value of $6 billion. Shi envisions his company growing to the size of oil conglomerates as the world increasingly shifts from fossil fuels to renewable energy. His trailblazing efforts have also inspired six other former UNSW students to play a leading role in successful Chinese solar ventures of their own. As a result, China seems poised to overtake Japan as the global leader in solar-cell manufacturing. A worthy legacy for a farmer's son from Yangzhong.